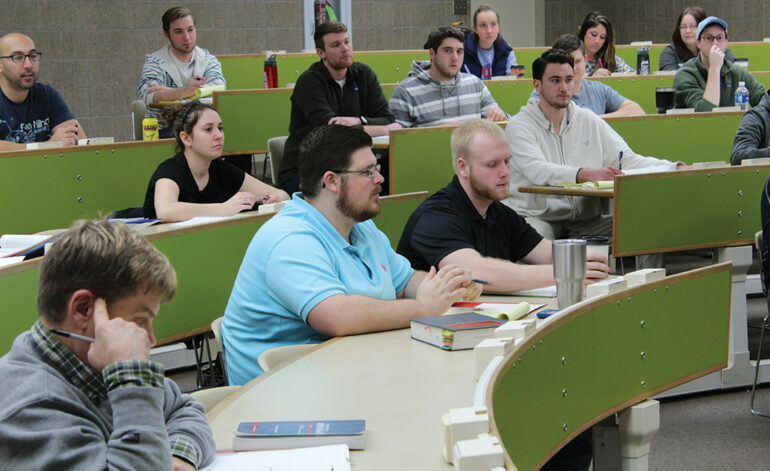 Only three weeks into spring semester, USD School of Law students are preparing for the bar exam. The law school has seen a relatively low passage rate of the bar exam passage in recent years. Historically, passage rates for the bar, the test lawyers are required to pass to practice law, have been as high as 95 percent at USD. The trend of students passing the bar changed in 2014. That year, the bar passage rate dropped to 75 percent, and it dropped even lower to 70 percent in 2015. Law school faculty are working as hard as they can to get passing rates back up, said Thomas Geu, the law school dean. There are many reasons that students aren’t passing the bar, Geu said. One is because of a drop in law school applicants, which means many schools have had to loosen their standards for admittance, thereby accepting students who are more likely to struggle. USD did change their admission standards, but not enough to explain the drop, he added. Another explanation for the decreasing rates may have to do with the exam itself. The bar exam is split into two sections, which can be passed individually. Students take a multiple choice portion the first day, which is standard among most states. The second day is spent on an essay portion, which is more specific to South Dakota. In South Dakota, unlike most states, students can pass one section and fail the other. Students are required, however, to pass both sections of the test to practice law in the state. In bar exams done in some other states, if a student does poorly on one section of the test and does well on the other section, they may still pass. Most students take a bar exam preparation course in the summer before taking the test in July. Students usually take a week break after graduating and then start the intense course. The online courses often involve six weeks of studying for eight hours a day, and can cost thousands of dollars. Faculty in the law school said the course is necessary to pass the bar. “Most students, I’d say all students, buy a commercial bar preparation course,” Young said. Failing the bar exam could mean having to take it again months later. Students who fail the exam could lose jobs they’ve committed to. As a result, many find themselves out of a job with no way to pay off the debt they acquired in law school. Because USD’s law school is the only law school in the state, the low bar passage rates have raised concern that an already starved rural South Dakota will be left even shorter of legal advice, Geu said. USD’s law school isn’t the only one experiencing low bar passage rates. Passing rates have been decreasing all across the country. In July of 2015, only 62 percent of students at the University of Montana passed the bar exam, according to the National Conference of Bar Examiners. In the state of California, only 47 percent passed in July of 2015, according to the NCBE. For this reason, Ashley Brost, a third-year law student, believes it’s wrong to compare USD’s bar passage rates with those of other schools. Regardless of bar passage rates, Brost believes she’s well prepared to practice law. Next week, the American Bar Association, which is in charge of accrediting law schools, will be voting on dramatic changes to the accreditation standards. The proposed Standard 316 would establish a cut off for bar passage rates. Schools who are unable to make the cut could lose their accreditation. Many in the legal profession are opposed to the change. Geu said Standard 316 may have a negative impact on USD’s law school, because it could potentially imperil the law school’s accreditation. Geu, however, didn’t sign a letter circulating among law schools opposing Standard 316.